Who should not take Restoril? What conditions does Restoril treat? List Restoril side effects by likelihood and severity. Since this drug makes you drowsy, do not drive, use machinery, or do anything that needs alertness until you can do it safely. Alcohol or marijuana can make you more drowsy. Avoid alcoholic beverages. Talk to your doctor if you are using marijuana. What should I know regarding pregnancy, nursing and administering Restoril to children or the elderly? Does Restoril interact with other medications? Should I avoid certain foods while taking Restoril? 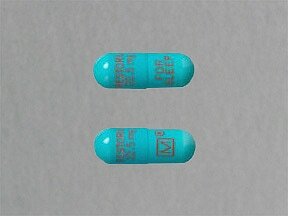 This medicine is a blue, oblong, capsule imprinted with "FOR SLEEP M R" and "RESTORIL 22.5 MG RESTORIL 22.5 MG". 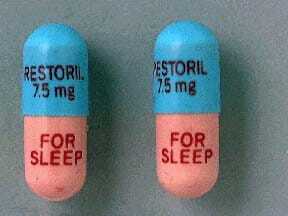 This medicine is a pink blue, oblong, capsule imprinted with "RESTORIL 7.5 mg RESTORIL 7.5 mg" and "FOR SLEEP M". 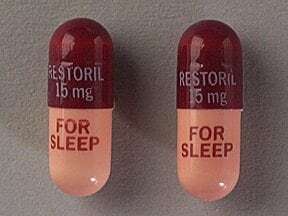 This medicine is a pink maroon, oblong, capsule imprinted with "RESTORIL 15 mg RESTORIL 15 mg" and "FOR SLEEP M R". 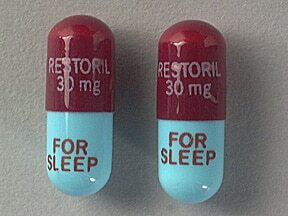 This medicine is a maroon blue, oblong, capsule imprinted with "RESTORIL 30 mg RESTORIL 30 mg" and "FOR SLEEP M R". Are you considering switching to Restoril? How long have you been taking Restoril?